There is a beautiful time right before sleep where most ponder the meaning of life or think about all the things they have to do the next day but for me, this time belongs solely to bacon. Now, bacon is in my heart and mind most of the time, but you must know these pre-sleep thoughts are the most valuable thoughts my brain produces each day. For some reason, I come up with all of my recipes in this sweet, sweet moment before departing from the real world for the next seven (or hopefully more like ten) hours. And when I wake in the morning, it’s like it was all a dream, but one that I can immediately make into a reality. 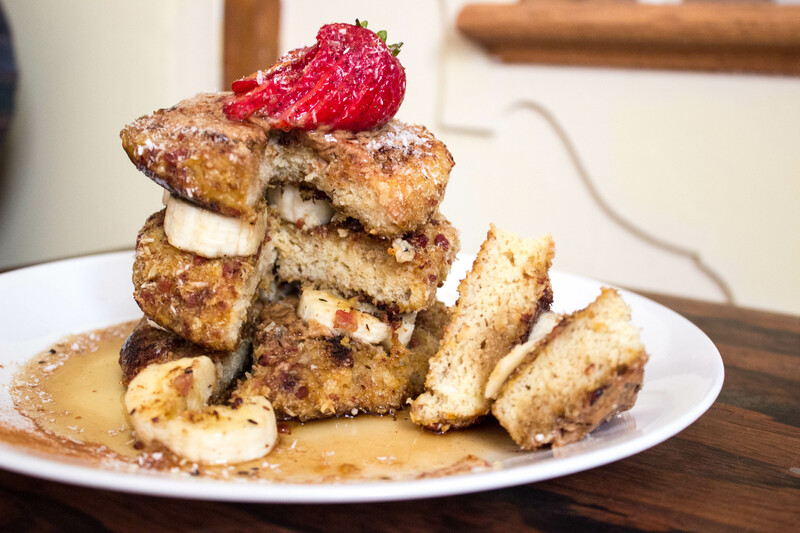 This french toast recipe is the product of one of these late-night unintentional food brainstorms. My sleepy, half-conscious rationale: bacon belongs in breakfast. Bacon and pumpkin are a completely underrated duo. Paleo people constantly crave bread. Bacon belongs in everything, so my first two points are moot. So with these thoughts, I say why not make Paleo English Muffins, soak them in pumpkin because hello, it’s Fall, and then crust it all up with some bacon and shredded coconut because coconut is also awesome. Then spread almond butter everywhere, add your favorite fruit, and stack it all up because I’ve been obsessed with stacking things lately. Then douse in syrup or honey or BOTH because I actually used both. Just do it. 1. In a medium frying pan over medium-low heat, add diced bacon and sauté for about 5-6 minutes, or until fully cooked. 2. Using a slotted spoon, remove the cooked bacon to a plate lined with paper towels to absorb the grease. Pat dry. 3. Once bacon has cooled, crush up into the tiniest pieces possible, or use a Vitamix/food processor to do your dirty work. 4. While the bacon is in the frying pan, combine all ingredients for English muffins in a small bowl. 5. Grease two threeish inch glass Pyrex dishes or something equally as microwaveable. 6. Separate the batter into the two separate microwave-safe dishes. 7. Put one dish in the microwave and cook for two minutes. Repeat this process with the second dish. I didn’t do them together because that would change the cook time. You know, science. 8. After each muffin is finished cooking, remove from dish onto a cooling rack. 9. Once the muffins are cool enough to touch, slice in half creating two half as thick pieces. Use a bread knife, people. These things are fragile. 10. In another small sized bowl (sorry for all the bowls), combine pumpkin purée, eggs, milk, vanilla extract, cinnamon, cloves, nutmeg, and maple syrup. 11. Pour mixture into a dish large enough to fit all slices of English muffin without touching. I used a long, rectangular glass Pyrex dish. I swear this isn’t an ad for Pyrex. 12. 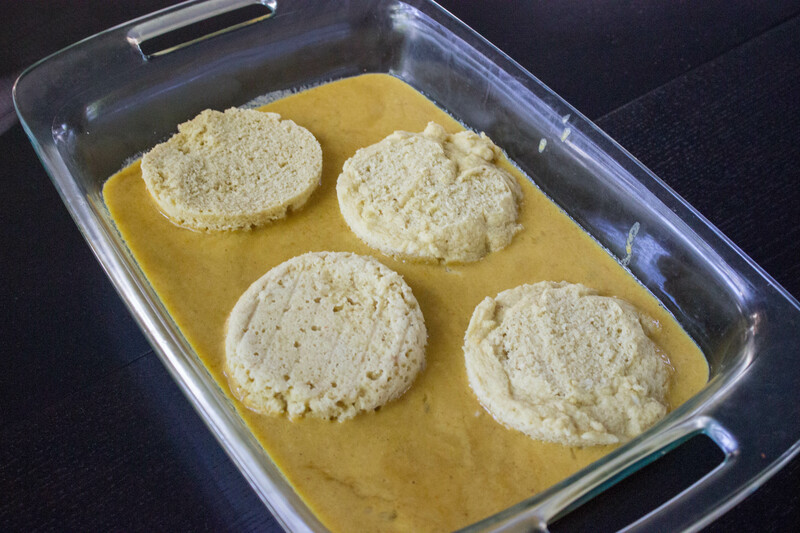 Place English muffin slices in pumpkin and egg mixture and let soak for about a minute. Flip over and wait equally as long on the other side. 13. While your English muffins are soaking, combine crushed bacon and unsweetened shredded coconut in a shallow dish. 14. Grease and heat a large frying pan over medium-high heat. I like to let mine heat up while I crust the muffin slices. 15. Dip soaked English muffin slices in bacon and coconut mixture, covering every inch possible. 16. Add to frying pan and cook for about 2 minutes on each side, or until golden brown. 17. Stack it all up with your favorite fruit and something creamy and delicious like almond butter and douse (at least three steps past drizzle) it all in maple syrup and honey. Both. It’s an order.